Lets Talk Wigs » Human Hair Wigs • Jon Renau • Lace Front Wigs • Monofilament Cap • Rene of Paris • Sales • Synthetic Wigs » New Arrivals You’ll Adore for July! New Arrivals You’ll Adore for July! If you are like me, you change up your hairstyle almost as often as the weather. The dramatic change in style, length, or color, should not inhibit you in any way. Switching styles easily and in less time is one of the appeals wearing wigs, extensions, and ponytails has over other hair styling choices. Worry less about what others may think, and more about what you want. This wig is part of Amore’s Designer Series by Rene of Paris. Emily includes Amore’s double layer, hand-tied, monofilament cap construction. Monofilament caps allow air to flow more freely, reducing heat and moisture build-up. This wig gives you body and face framing layers; color shown above is Creamy Toffee; available in 28 colors! Dani wig is a pixie cut, short wig with asymmetrical bangs and gorgeous layers. Available in Hybrant colors to match your personal style and fashion sense; this style is perfect for those suffering from hair loss, bald patches, or receding hairlines. Both comfortable and lightweight — this wig is an excellent choice for upcoming social gatherings, especially outdoor parties. Available in 27 colors. More than beautiful to look at, Sophia offers the best in construction and quality. Made from 100% hand-tied Remy Human Hair on a monofilament cap, with Smart Lace technology, the styling possibilities are almost limitless. It already has the layers in case you decide to put big curls all over, for a different look. The front lace makes off-the-face styling a breeze if you get tired of the bangs. Sophia is versatile, made with the highest quality hair and materials, plus available in beautiful colors for summer. Available in 14 colors. Stay tuned for more new styles, or browse them here. 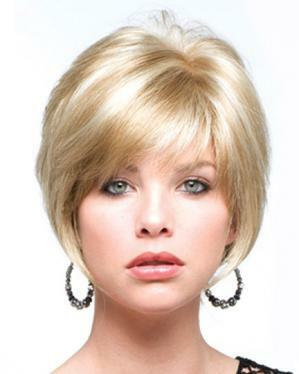 Stylish Wig Styles on Sale Now!